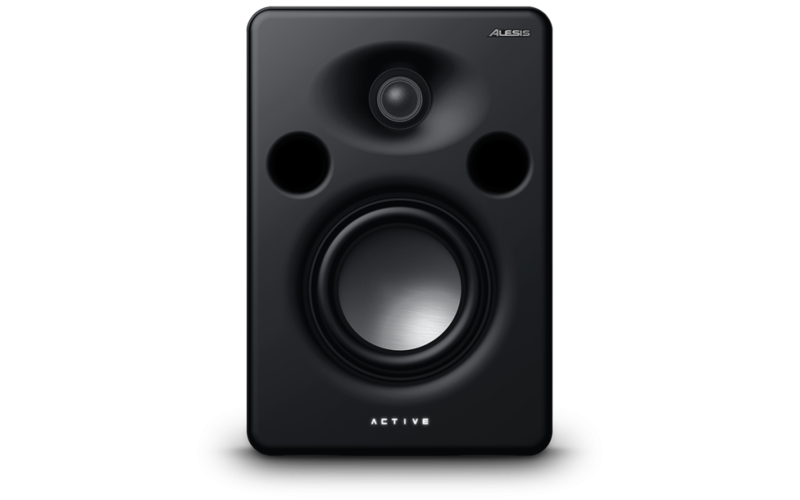 Alesis has long had a reputation for making highly affordable studio equipment, and the M1 Active monitor line is no exception. The MK3 version has built on its previous models to refine the sound of the speakers, while maintaining a temptingly low price. The speakers feature a new 5in. aluminium woofer, which Alesis claim improves the transient attack of the speakers, as well as improving frequency response linearity. Two ports in the front of the speakers give an extra low frequency boost, and the housing has undergone a modern redesign, which also helps improve the overall sound. The units themselves look great – the modern redesign giving them a spacey feel, and the backlight behind the Active logo at the bottom is a nice touch. There is very little in the way of controls on the back, just power and volume, and the combi jack/XLR input makes it easier to plug in your audio source, whatever it might be. I’ve owned a pair of the origin M1 Active 520s for around 8 years, and still use them at home, so I was interested to see how they compared. From the outset it’s very clear Alesis have been hard at work, I was very impressed with how smooth the Mk3s were in comparison – switching back and forth between them showed how controlled the new speakers were, with much fewer odd resonances in the mid and high spectrum than the old model. The extra front facing ports have certainly done their job – the first thing you notice when you listen is the bass. Alesis quotes a frequency response between 55Hz-22kHz (±3dB), and it sounds to me that there’s a significant boost a little above that low frequency. For me, it’s too much, almost obscuring the higher frequencies. Having listened in an acoustically treated room, I’d be concerned about using them at home, where untamed resonance could further alter the image in the low frequency range. The lack of EQ control seems a shame given how useful I found it on the Mk1 speakers – being able to adjust the bass response to fit a compromised space was a valuable thing. That being said, I found the overall impression of the speakers good, especially considering the price. I feel certain I can hear the effect of the stiffer aluminium drivers, which give good clarity of depth and stereo image. Listening to solo piano and orchestral recordings I’d made recently, I was impressed with the sense of the space conveyed, with the soloist and strings very clearly sitting forward compared with the wind and percussion. Listening to some heavy rock and electronic tracks I found that although the low end was very hyped, it didn’t cause it to sound as flabby or uncontrolled as I’d have expected. To conclude, for the price (approx. £109 / $99 / €129 EACH) these monitors are certainly a worthy investment – particularly if you like a bit more low end in from your speakers. The clarity of space and overall frequency response is a huge improvement over the original model, so if you want to get started with some proper studio monitors without breaking the bank, the M1 Actives are a good place to start. To read more, visit the Alesis M1 MK3 page.